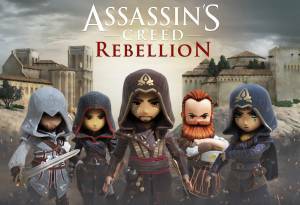 Assassins Creed Rebellion is a turn-based squad strategy game on mobile where Ezio and the rest of the brotherhood are shrunken down to chibi-style characters in the battle between the Order of Assassins and the Knights Templar in 15th-century Spain. 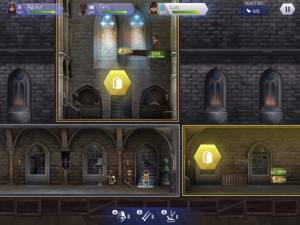 Gameplay is a combination of base building which involves filling places in your 15th century Spanish headquarters with different rooms where you can complete tasks such as craft armour and weapons, gather intel, and collect coin. The purpose of these rooms is to support the other aspect of the game which is Assassin's Creed Chronicles-style side-scrolling missions where you assemble a band of assassins and take them on a series of turn-based tests of their killing, free-running, stealth, and trap-disarming prowess. Before putting together a team for your next mission it is advised when you are at the Edit Team screen you pay attention to the Team Recommendations guide in the top right corner. Make a note of the three icons present and make sure you put a party together that closely sticks to that setup using your strongest Heroes. More often than not you will only be asked to take two Hero role types into a mission leaving you to decide on the third Hero option. A good strategy for your third Hero is to add one who can utilise healing abilities so they can help keep alive your other two Heroes who will be taking on most of the tasks. When you are putting together your three-person team for a mission don't just choose the best character you have at the role that syncs up with the Team Recommendations but also take the time to read up on their stats and skills. This will give you the opportunity to choose at least one Hero that has stat boosting abilities or are able to heal other members of your party. You may also want to consider a Hero that is a Specialist who has the ability to get your party past traps that lead to safer routes during certain missions. Completing a certain amount of Story Missions will enable you to unlock the Standard, Loot, and Legacy Missions and the Rewards each of them yield. Upon completion Story Missions will reward you with a decent amount of every item type. Standard Missions tend to reward you with Training Codex Pages, Brotherhood Experience, Coins, and Building Material. Loot Missions are filled with the different types of Ore that are used to upgrade your Heroes's equipment and also Brotherhood Experience, Coins, and Building Material. And completing Legacy Missions will enable you to accquire extra DNA Fragments as well as Brotherhood Experience, Coins and Builidng Material. These three mission types can only be completed a limited amount of times per day, this is 5 times for each Standard and Loot Mission and 3 times for each Legacy Mission. Whatever mission you decide to tackle you need to focus on trying to complete it with a 3 star mission ranking. This can be achieved by making sure all three of your Heroes make it to the end of the mission. The stars that you are rewarded will help fill up the reward meter found in the top corner of the Missions map screen on each region that you unlock. Once you have completed a mission with a 3 Star rating you will unlock the Rush option which will instantly allow you to complete a mission and collect its Rewards. Helix Credits is a valuable currency that at the start of the game you will be given a decent amount of to buy several goods within the shop. Spend this initial serving of Helix Credits on Encrypted Cubes, more specifically the 10 DNA Cubes selection. This purchase will make it easier for you to get through the game's first series of missions. You will slowly get more Helix Credits as the game progresses which you should save and only spend on acquiring more DNA Fragments. You can get DNA Fragments for a particular Hero by going to the Heroes menu and selecting the Hero you still have yet to unlock and choosing the 'Find DNA' option in the bottom right corner of the screen. This will enable you to see the missions that feature that Hero's DNA Fragments as a reward which you can then target. Once you have unlocked the Mission types by playing Story mode you should focus on trying to acquire the max amount of Rewards each mission gifts you by making sure you hit the completion limit for each of the game's Mission types on a daily basis. In order to do this you will need to replay Missions. It is important that when you assign a Hero to a room you make sure that the one you select is suitable for the task at hand. You will be able to identify which Hero this is as they will have a certain symbol attached to them during the selection process. The best time to set up your training room sessions is before you go offline as it will take at least 2 hours to train any hero. Although it does not matter which Hero you assign to the training room you will need to make sure you upgrade ever Hero you have. Make sure you focous on completing your Daily Missions as this will not only enable you to receive a steady stream of Brotherhood XP, Helix Fragments, Intel, and Coins but also allow you when you reach Brotherhood Levels 6, 7, and 8 to participate in the limited time Events which are guaranteed to give you a decent amount of DNA Fragments, new Heroes, Helix Credits, and Cubes. Although the Achievements take a while to complete they are worth keeping an eye on as they yield DNA Fragments, Helix Credits, and plenty of coins when they are completed. No discussions open for Assassin's Creed Rebellion at the moment.